Latest UFO sightings 2011 – Interesting footage of strange stationary craft hovering in the night sky over Taranto in Italy. This video was recorded on Monday, 7th February 2011 at 8 pm. Amazing video. 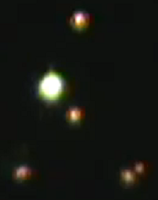 In one part of this video there are others lights sightings. They seem like ufos assisting the other one. its the probe i hear on the 80m band for slovenia HAM WEBSDR station.SERIOUSLY. listen to the site if you have java installed.<br /><br />the others look like scout craft. small and fast movers, but not warp or high speed capable. fast enough to miss, tho. As you can see it is on the horizon and there is light above that spot to the left, perhaps its a view towards a hill. And for the &quot;assisting others&quot; well thats partially true, when viewing ambulances and emergency vehicles they tend to give that same light off when in the distance. Perhaps check and see if there was an emergency in that area.